How will your office change in the next 2 years? The 2017 NeoCon Office Furniture show just wrapped up in Chicago and here is a insider sneak peek at the new trends coming soon to an office near you. Here Come the Stand Up Desks! Without exception, the biggest single trend that most offices are not ready for is the rapid shift toward sit/stand desks. Virtually EVERYONE who displayed a desk at NeoCon had a standing option. 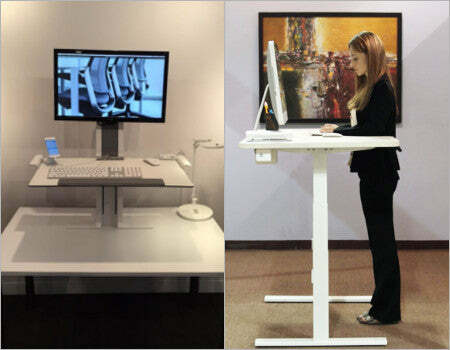 Most are height adjustable desks that let you sit or stand at the push of a button. Super cool and sleek. Since only about 10% of office workers stand up during part of their workday, the standing-at-work trend still has a long way to expand. With American office workers becoming educated about the dangers of over-sitting, we should continue to see more standing desks in our offices. Most are very minimalist in design, with less storage for files, so be ready to reduce your paper files and get more organized. Standing conference tables also will be ushering in more "standing meetings" to keep members more engaged and keep meetings shorter and more focused. Ever since sitting was declared the "new smoking", the rapid expansion of stand up desks was inevitable. 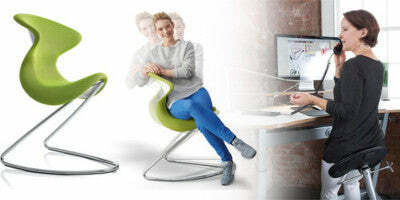 If you can't bear the thought of standing all day, maybe you can add motion to your chair. Lots of options to balance, wobble, lean and glide your way to more productivity. Active sitting started with balance balls, but now takes many forms from sitting to leaning. Surprisingly stable, these motion chairs give your core, legs and torso a mild exercise routine. These motion seats give you a workout all day without you really noticing it. George Jetson, meet the millenials. 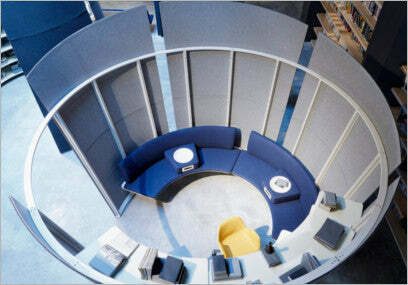 Will the cubicle transition to a futuristic work-pod? These individual work-stations are best suited as temporary space to focus on a hot project, isolated from distractions. A private sanctuary to get away from the bustle of your open office so you can power out on your project. Pods could work well for tele-commuters who don't have a permanent desk at the office. Most of these individual "lounges" provide back support in an "alert-recline" position. 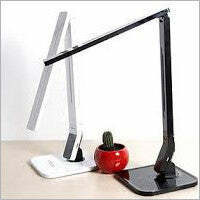 An adjustable, angled work surface fits your laptop or tablet. A footrest? Who thought you would ever have your feet up at work? Glass walls help promote the "open-office" environment. So even when "behind closed doors" you are still connected to the workplace and even if co-workers can't hear you, everyone is connected. LED leads the way into the future of office lighting. Sleek linear strip lamps and Disc-shaped round lamps are both great choices for putting the light exactly where you need it for maximum productivity. Fluorescent and incandescent are hard to find in 2015. So look for streamlined, sleek and energy saving! Lots of bright fabrics bring the office alive. Gone are drab gray and beige. Welcome fruity colors like tangerine, lime, grape and aqua. Millenials again put their stamp on the workplace by bringing it alive with color. So keep your eyes open for these hot workplace trends to start showing up at an office near you!